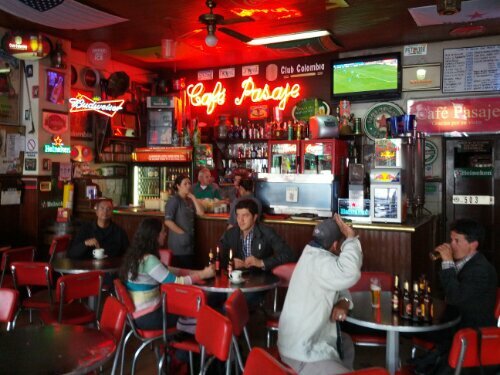 Café Pasaje is near La Candelaria (the old colonial area) of Bogotá. It is tucked on the side of Rosario plaza, just beneath the historical Avenida Jiménez. It sits next to the emerald trading neighbourhood, the Museum of Gold, the Central Bank, several other ministries and government offices, and on top of which, a few universities that dot around the area. Its privileged location has enabled it to be the melting pot that’s filled with Colombians from all fronts. The nearly 80 year-old cafe has grown up with Colombians who come from different social stratas, ages, and backgrounds; from the students and hippies who drop by from Rosario and Grand Colombia university, the regular pensioners who look like they have never left their spot, emerald traders from next door, to Central bankers and bureaucrats coming for their afterwork beer. Being in a tourist area also means frequent visits from the tourists who got lucky and bumped into the place by accident. Why should you go to this old, and in many ways, a rundown café? Well, besides being part of history, the most obvious reason for many is the unbeatable price point. 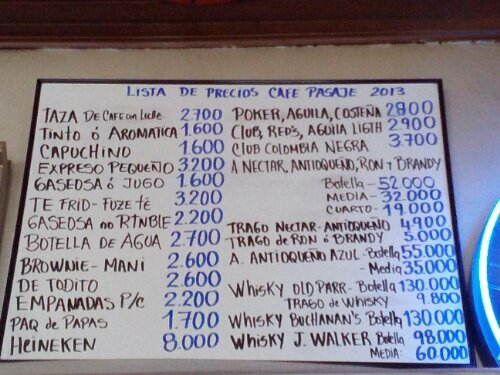 I am not going to even try to understand how the café hangs on to its lifeline with those prices. I’m simply going to enjoy being a beneficiary of these inflation beating prices. The combination of attractive prices and a good selection of both alcoholic and non-alcoholic drinks makes Pasaje popular during any time of the day. The place has an obsolete feel to it. It feels like it will defy time and last forever. Surrounded by decorations from the bygone era, you find yourself gravitated towards the chance to take a break and stand still in time. I’ll have to check this place out when I travel to Colombia! $1.5 for beer is such a steal and I love coffee! Thanks!